A breakfast casserole can be the perfect make-ahead meal when you’re entertaining overnight guests. Whether you have people in town for the holidays or a weekend visit, a breakfast casserole like this can free up your time to spend hanging out with your guests rather than cooking in the kitchen. We love this breakfast casserole recipe because it’s simple and incredibly delicious. The main stars of this breakfast casserole are the eggs, of course, and the broccoli. They make up the bulk of the dish. To keep this breakfast casserole recipe light and healthy, almond milk is used instead of the traditional heavy cream. There’s also a blend of cottage cheese and feta cheese rather than the typically used cheddar cheese. Both cottage cheese and feta cheese contain less fat than cheddar cheese, which makes this casserole heart-healthy and lower in calories. 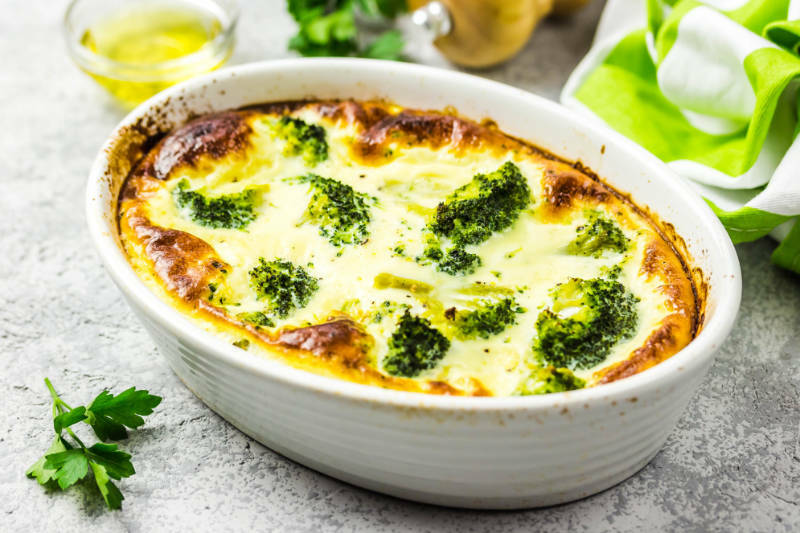 The breakfast casserole gets its wonderful flavor from the rest of the ingredients that are used, including garlic, onion, fresh parsley, and a simple seasoning of salt and pepper. You can assemble this entire breakfast casserole the evening before, preparing the casserole in a large, oven-safe dish. The casserole gets covered in plastic wrap and refrigerated overnight. The next morning, simply place the casserole out on the counter for 30 minutes, while your oven preheats. Then pop the breakfast casserole into the oven to bake for about 50 minutes. You can let the casserole slightly cool before cutting them into neat squares for you and your guests. In a large bowl, combine all of the ingredients together until mixed well. Grease a 9"x13" oven-safe dish. Pour the casserole batter into the pan. Cover with a sheet of plastic wrap and refrigerate overnight. The next morning, take the casserole out of the fridge and allow it to rest on the counter for 30 minutes. Preheat the oven to 350°F. Remove the plastic wrap from the casserole dish and bake the casserole for approximately 50 minutes, until the center of the casserole has set and is no longer wobbly. Allow the casserole to cool for about 5 minutes before cutting up and serving.